Do you like ninjas? You do? Well did you know that ninjas like cake? More than like – they love it. They want its little cakey babies. Ever wondered what happens when a ninja loves cake just a little bit too much? Well, you’re not alone. One-man game studio, Fingerland, had the exact same thought and so created Fat Ninja, a highly addictive hand-drawn arcade game for iOS. The hapless hero has gorged himself on too many battenbergs and now must embark upon the harshest training regime in ninja lore – the Tower of Torment(TM). The aim of the game is to help Fat Ninja scale the Tower of Torment without breaking any of the platforms. Simply tap and drag anywhere on the screen to build up power and then release to watch Fat Ninja leap to the next platform. But, be careful – land softly or the platform will break! With five different types of platform – steel, concrete, wood, bamboo and glass – you’ll need to keep your wits about you to ensure you don’t land too heavily and smash through to a long fall and a facefull of paving slab. Control and precision is central to the game, but speed is also important: hesitate for a second too long and the platform will start to crack. 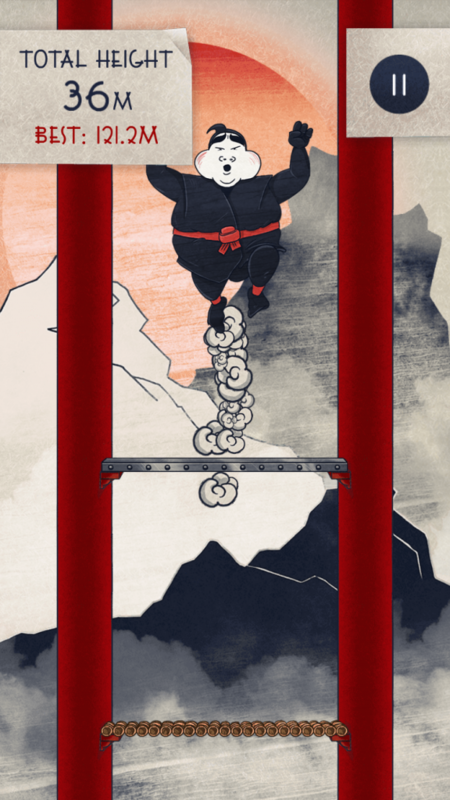 Watch out for three special power-ups that help Fat Ninja scale the tower: a diet pill to lighten his load, an air brake to instantly stop his fall with a tap of the screen, and a can of beans for a flatulent foot up. You can only use one power-up at a time though, so make good use of each one to gain the highest score. With hand-drawn graphics and original gameplay, Fat Ninja is one of a kind in the appstore. Based on the simple premise of jumping from platform to platform without falling, it is easy to learn but hard to master.